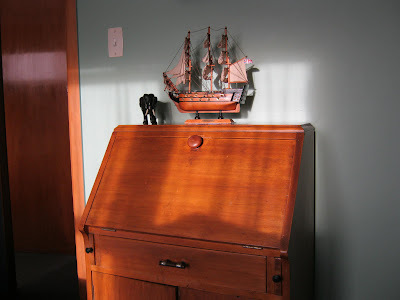 The sun is getting low in the sky allowing it to shine through the west-facing window to cast its light on our old family writing desk with the model of the warship HMS Victory, sent as a gift from an English friend, and a black model elephant brought back from Thailand by our daughter Sandra after a holiday there. Nice effect Dave. I have actually been on the HMS Victory. I went with my parents once when I was a young fellow. It was very exciting for a young guy and a great way to bring history alive. I remember that day very clearly. HMS Victory is located at No2 Dry Dock at Portsmouth's Royal Naval Dockyard, England.